Once you've created an account under your domain, you can go straight to https://mail.live.com and log in. Though happy with having my e-mail accounts available online, I also wanted to read my mail on my phone. It's a somewhat well hidden secret that you can use ActiveSync to connect to your custom e-mail accounts, but I stumbled upon the settings here. Here's how I set up the e-mail accounts for my custom domain on my iPhone. Go to "Settings" -> "Mail, Contacts, Calendars" -> "Add Account..." and choose "Microsoft Exchange" as the account type. Enter the e-mail address, password, and give the new account a reasonable description. When pressing "Next" the setup will fail and you'll be asked for a few more details. Enter "m.hotmail.com" for the "Server", and leave the "Domain" empty. Enter the e-mail address in the "Username" field. And that's it! Press "Next" and the next screen lets you choose whether you want to synchronize mail, contacts, etc. Your custom e-mail account is now set up on your phone. Does this then give each user access to the other Microsoft services ,like skydrive, calendar etc? I just tried Skydrive, it worked! The calendar gave an error message, not sure whether that's related to the account or if there are issues with the service just now. If anyone can make this work, or find the person at Microsoft responsible for randomly setting EAS server names for Outlook.com accounts and Microsoft live custom domains (see http://domains.live.com), then they would be a god. I have been trying to find a solution to this for 6 months, and have spent about 80 hours talking to friendly but incompetent Microsoft Support People in the departments of, Microsoft Accounts, Outlook.com Accounts, Office 365, Exchange Server Support (because all other personnel transfer me there because they don't understand how email works). I have tried the following servers names to setup Exchange ActiveSync (EAS) to connect with my live custom domains (see http://domains.live.com) to the Outlook 2013 email client. And, I am 99.9999999% certain that of the 1000 times I typed in the password, I got it correct at least once. I am not the only one who has been trying to find a solution to this problem, nor have I been trying the longest. I have found blogs, forums, and even threads here that are over a year old and have no solution, or people claim to have a solution that worked for them, but it no longer works. What is the deal. You would think that Outlook 2013 should automatically setup any Microsoft related service automatically. All the other programs, excel, word, etc work seemlessly through skydrive to sync all settings based on Windows login credentials. Why is Outlook.com and Outlook 2013 have so much difficulty with this. Email is the oldest thing in the book to sync. "Apps that support Exchange ActiveSync", which I assume would include Outlook 2013, but apparently not. "Microsoft Office -> Get info on setting up Outlook.com in Microsoft Office Outlook here." But, that makes you believe it will work automatically, which would be the ideal behavior, but it doesn't work with Microsoft live custom domains. here I am. Still no solution after a total of 6 months searching, and an unused Outlook 2013, which I paid for. Hopefully, this highlights how absurd it is that Microsoft hasn't just given out the Exchange ActiveSync settings for Outlook.com Custom Domains that will work with Outlook 2013. Anyone? I personality know 3 IT colleagues who had the same problem (They don't anymore, they gave up and instead use IMAP with gmail's custom domains.) If I know 3, then how many other silent IT guys are out there? I'm sorry to hear that you've had that much trouble. 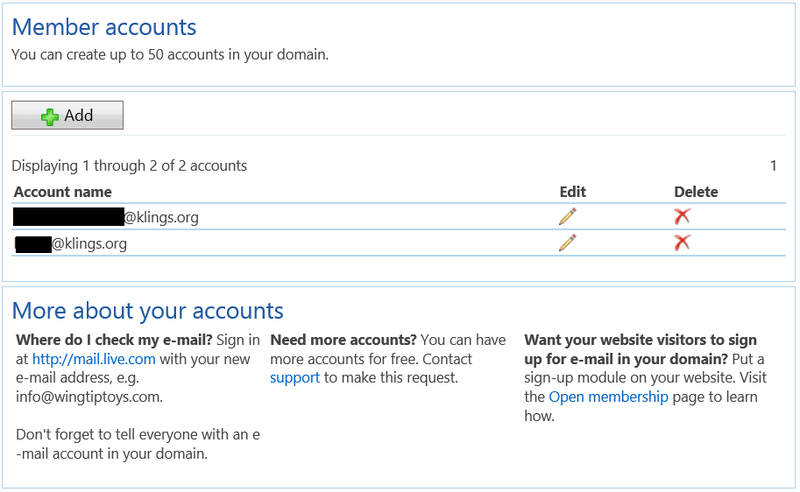 I just tried setting up one of my klings.org accounts in Outlook 2012. I chose to set the server settings manually, and added an EAS account. It failed on the first attempt, but it worked fine on the second attempt. I set the server to m.hotmail.com and used the e-mail address for the username. I agree that this would have been much easier if they let Outlook discover the settings automatically! I have something weird going on. I have setup our mail@limb.org account successfully with your steps above. but I cant seem to setup any of the 2 other mail accounts. user1@limb.org and user2@limb.org..
Any ideas? I can login via the web fine. Every one know outlook is very popular mailing websites and also provide many additional features for the user. This post is really provide very amazing information for the outlook custom domains. Apk uncle is a free paid version app which it include the apps and games.It is a popular app in present market. Dissertation writing help is a term which is best for students help provide, students can easily get our help for their dissertation help online service. We provide best all Dissertation Help to the students at the low-cost price. Book Now!